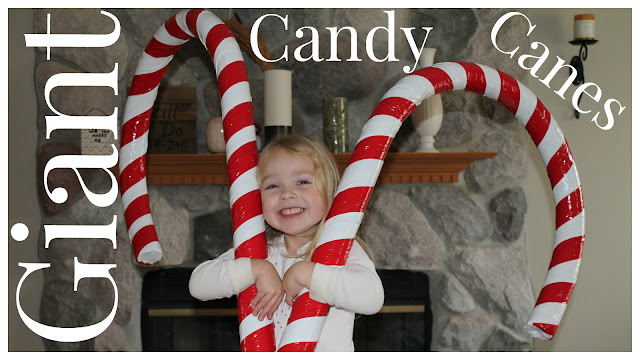 I was asked to help with some props for the Christmas play this year and so I signed up to make some giant candy canes, seems easy enough, right? I started by looking around on Pinterest, Google, and YouTube for ideas. I wasn't impressed with what I was finding and so I came up with a design of my own. There are some great ideas out there using larger PVC piping and cardboard tubes but the cost and time required was too much for what I was in for. So I decided on the following process. Step 1 - Start by laying out the shape of the candy cane on the plywood. I used a trash can lid to trace the curves and adjusted it until I liked how it looked. Step 3 - Start to feed the PVC pipe through the template heating it with the heat gun or hair dryer as you push it through. This process takes a bit of time, just keep applying heat, alternating sides, and pushing the pipe further into the template in increments. Step 4 - Once the pipe is shaped and cooled pull it out of the template and then slide two pool noodles over the PVC pipe. Cover all of the pipe except for whatever is left over a the bottom. You can cut this extra piping off and make the candy canes as tall as you need them to be. Step 5 - Start with the white tape and wrap a piece around the seam between the two pool noodles. Then starting at the top, wrap the white tape around the noodles on an angle until you get to the bottom. Do this about three times until all of the pool noodle is covered in white tape. Step 6 - Starting at the top, wrap the red tape around at an angle (like a candy cane) until you get to the bottom. This is the hardest part, try to keep the tape flat and evenly spaced as you wrap it. This is best done with two people, have one person hold the candy cane and the other hold the tape. Have one person turn the entire candy cane as the other applies the tape. You may have to work with it a little bit before you get it the way you want it.